Howard Philip McKeon, known as Buck McKeon, was born September 9, 1938, in Tujunga, California. He served a two-year mission for the Church of Jesus Christ of Latter-day Saints and then attended Brigham Young University. Taking a hiatus from his studies, he married Patricia Kunz and started a career as a businessman in the Santa Clarita Valley, California. He subsequently returned to school and completed his bachelor’s degree in 1985. Howard and Patricia have six children and 28 grandchildren, and currently live in Santa Clarita. First elected to represent the 25th Congressional District of California in 1992, McKeon earned a reputation as a leader in the national education reform movement. Because of this, McKeon was elected by his colleagues to serve as Chairman of the House Committee on Education and Workforce. He served from February 2006 until January 2007. 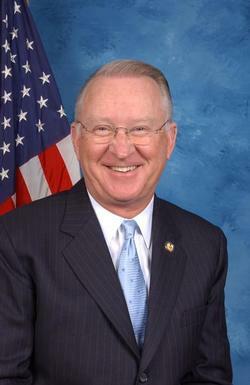 In 2009, McKeon served as ranking member of the House Committee on Education and Labor. In June, the House Republican leadership appointed McKeon as the ranking Republican on the Armed Services Committee after President Barack Obama nominated Rep. John M. McHugh, who was the ranking Republican on the Armed Services Committee, as Secretary of the Army. Under rules of the House of Representatives, McKeon was required to step down from his position as ranking member of the Education and Labor Committee, though he continued to serve on the committee. McKeon was named chairman of the Committee on Armed Services in January 2011. Prior to becoming Chairman of the Education and the Workforce Committee, Rep. McKeon headed the House Subcommittee on 21st Century Competitiveness, with jurisdiction over higher education, technology in education, teacher training, job training and welfare reform. In this role, McKeon helped to negotiate the formula that resulted in interest rates for the student loan program dropping to the lowest level in the Federal Aid Program’s 38-year history. In January 2014, McKeon announced that he would not seek reelection in the 2014 elections. He served in Congress for more than two decades. Before coming to Congress, Rep. McKeon served on the William S. Hart Union High School District Board of Trustees from 1978 to 1987. During that time, the city of Santa Clarita was incorporated, and its citizens selected McKeon as a member of the city council. At the city council’s first meeting McKeon was chosen as Santa Clarita’s first mayor.